IntelliJ IDEA 7 M1 introduces the full-blown support for Spring and Hibernate through the dedicated facets. Traditionally, Spring and Hibernate are integrated with a wide range of IntelliJ IDEA productivity-boosting features. With IntelliJ IDEA you can create Spring applications from scratch with just few keystrokes. Here I outline some examples that demonstrate how IntelliJ IDEA can help you. Very wide range of beans is supported. Each of them is created through a dedicated live template — all you have to do is to type values for required properties. 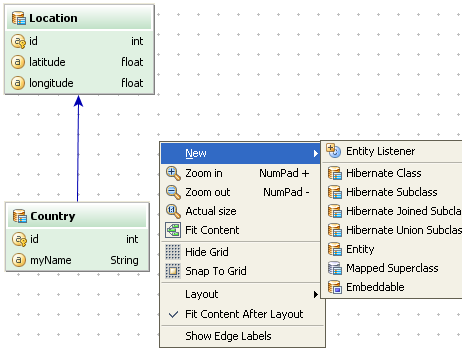 HIbernate diagram not only displays relationships, but lets you create classes and entities, automatically generating required code. As always, CTRL+SPACE code completion helps you with bean names, property values, settings and tons of other stuff. It can recognize your entire project structure and help even with beans you created by annotating Java code. IntelliJ IDEA refactorings are also Spring and Hibernate-aware, so you can modify and upgrade your projects at the full pace. To get your hands on and try Spring with IntelliJ IDEA, download the latest EAP build of IntelliJ IDEA 7 M1. 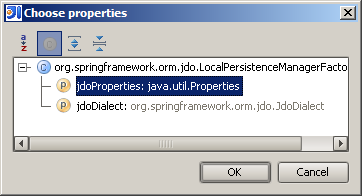 This entry was posted in New Features and tagged Hibernate, Spring. Bookmark the permalink. This feature is great, and really follows IDEA’s principles. I have only one question: would that API be customizable? With Spring 2.x namespace handlers that would be an uber-feature, like a quick IDE based on your DSL.